A ship bound for Surigao City ran aground Tuesday morning as it was about to dock at this city's main seaport. Marina Official and Philippine Coast Guard Officials are now conducting a marine inquiry on the incident that occurred at around 5:30 in the morning. Cokaliong Shipping Lines Surigao Branch Manager Antonio Espina said there were at least, 363 passengers aboard the M/V Filipinas Dapitan, all of them were safe and sound after the incident. The ship left Cebu Monday at 7 p.m. and was expected to arrive at 6:00 in the morning Tuesday here. Passengers were stranded for about an hour on the ship until two tugboats from Philippine Coast Guard transported them on land. Espina said the ship's management decline to give any comment on the incident pending investigation by authorities. "Kuyawan jud ko kay ang among cabin wala man maabli dayon. 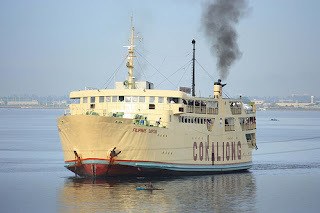 Kon nabuslot ang barko ug nitakilid, ambot lang gyod," Paz Viloces, one of the passenger of the ill-fated ship, said. Another passenger, Jennifer Blase, said she did not hear any loud noise when the ship runs aground. "Natingala nalang ko nga wala na modagan ang barko bisan pa sa pagpakusog og andar sa makina," Blase said. The passengers included some foreigners who said the incident caused them to miss their trip to different destinations, including Siargao Island. Espina said they will do everything to make sure that the ship would make it at the port. Two tugged boats tried to pull the ship onto the docking area to no avail. "It just so happen that the tides is very low this time," Espina said. Panfilo B. Olvis, deputy of Philippine Coast Guard Surigao Station said they cannot give any statement until they their investigation is over. Meanwhile, Marina Regional Director Bobby Carpio told this writer in a text message that he already issued a suspension of the ship's certificate.